Savitribai Phule Pune University, Pune. Maharashtra. Orientation Planning and management of higher education 19.12.to23.12.11 N.E.U.P.A., Delhi. Teaching Experience: UG and PG- 27 years. 1. Coordinator, “CERTIFICATE COURSE IN BASIC ORNITHOLOGY” Autonomous course run by Abasaheb Garware College, Pune and ELA foundation, Till 2008. 2. Director, Association of Zoologist, India. 3. Honorary Director: Histopathology Department, TOXINDIA, Contractual research organization. 4. Life Member, Indian Fisheries Association, Mumbai, India. 5. Fellow, Zoological Society of India, Bodhgaya, India. 6. Life Member, Indian Association of Aquatic Biologists, Hyderabad, India. 7. Life Member, The Society for Fisheries Economics and Development, Hyderabad, India. 9. Life Member Board, Progressive Education Society, Shivajinagar, Pune. 10. 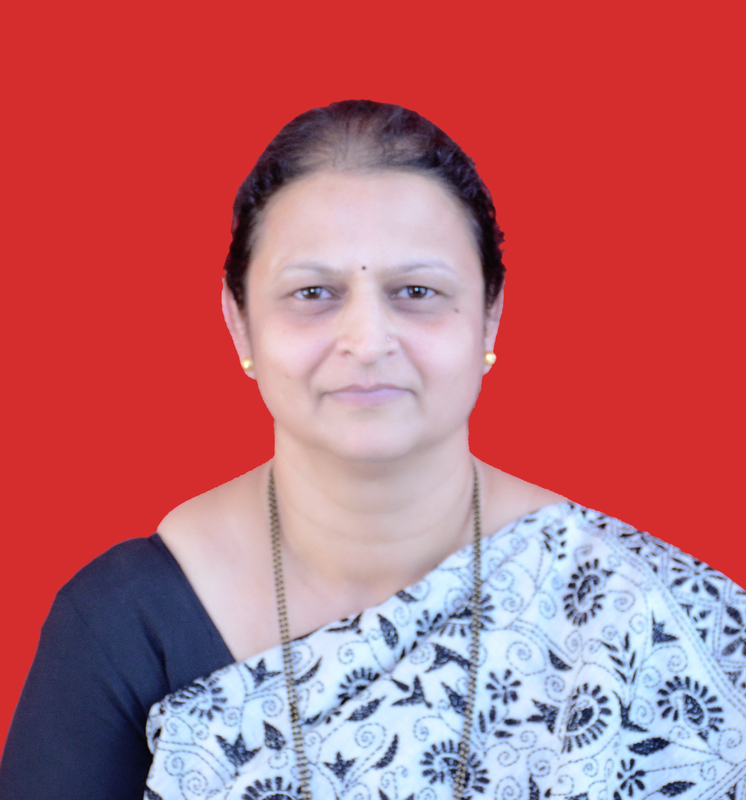 Governing Council Member, Progressive Education Society, Shivajinagar, Pune. 11. Member, Senate, Savitribai Phule Pune University, Pune. 1. 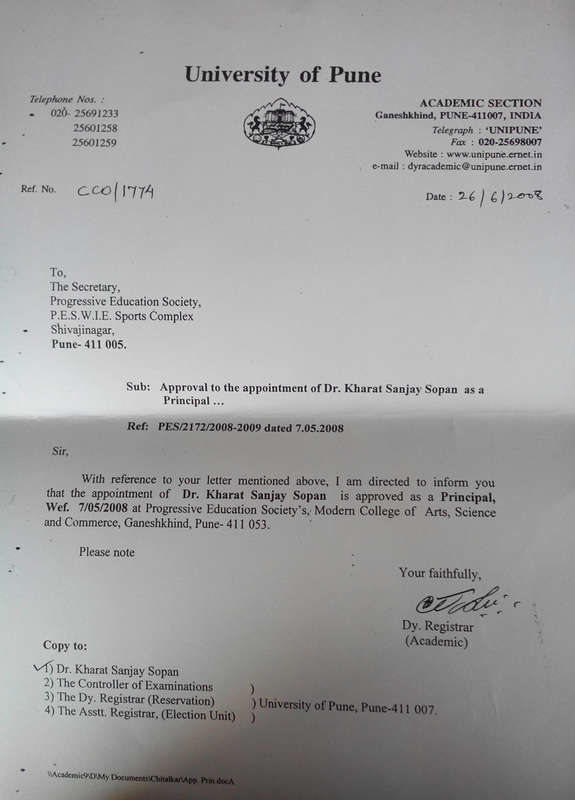 Received 2f, 12B of the University Grants Commission Delhi to college 2009. 2. Received Best College Award (2st Position) from University of Pune 2009. 4. “Efficient Energy conservation and management” State level First Award given by Maharashtra Energy Development Agency, Government of Maharashtra. 7. Received Best principal Award of Savitribai Phule university, Pune 2015. CONSULTANCY:- A. CONSULTANCY TO TOXINDIA, CONTRACTUAL RESEARCH ORGANIZATION, PUNE. 1. Honorary project leader for Indian Client under the project No 151201 and 151202, “ Repeated dose 90- Day ocular toxicity study with 28 day reversal periodof Dorzolamide, Brimonidine and Timolol ophthalmic solution in New Zealand White rabbits. Cost of project: Rs. 900000/- Dated. 20th Dec. 2012. 2. Honorary project leader for Indian Client under 2nd project: Project No. 140211 and 140213, “ Repeated dose sub-chronic and chronic oral toxicity study of chloropham technical in rat. Cost of project: Rs. 700000/- Dated.10th NOV. 2009. 3. Honorary project leader for Indian Client for project: Project No. 140402 “Repeated dose 90- Day oral toxicity study with 28 day recovery period of cetylated fatty acids esters powder 50% in mouse”. Cost of project: Rs. 450000/- Dated. 5th May. 2011. B. CONSULTANCY TO GOA UNIVERSITY. 1. TO MONITOR GOAN ENVIRONMENT. Cost of project: Rs. 1000000/- Per year Dated. 9th July 2013. C. CONSULTANCY TO ASWAMEDH AGRITECH & FARM SOLUTIONS SYSTEMS. 1. Mr vasant Narke – Ph. D. Awarded on 7th October 2014 from Savitribai Phule Pune University. Topic- Efficacy of Vitae Elixxir as an antimutagenic / anticarcinogenic agent. 2. Mr Nirbhay Pimple- Ph. D. Topic: - Study of Reproductive Biology of Osteobrama vigorsee and Rohitee ogilibee from Nira river, Bhor, Dist. Pune, Maharashtra. Relationships among family cyprinidae fishes. Ph. D. topic- management of insect pests, potato cutworms(Agrotis ipsilon, Peridroma saucia) and Pulse beetels (Bruchus chinensis, Linn,) using biosynthesized nanoparticles. 5. Gosavi Sachin Ph. D. Topic – Reproductive biology and digestive physiology of Pachypterus khavalchor, an endemic freshwater fish of the western ghats and its implications for conservation. 1. Reproductive Biology of Hill Stream Fish, Nemacheilus mooreh(Sykes). LAMBART ACADEMIC PUBLICATION, GERMAN. ISBN NO. 978-3-659-4358-6-7. 2. e- Book/ VCD on Innovative Teaching of Dissections- Part 1. 1. Kharat S. S., Dahanukar, N. and Raut, R. (2001): Decline of fresh water fish of Pune urban area. Journal of Ecological Society. Vol.13/14, pp46-51. 2. Raut, R., Desai S., Bapat, R. and Kharat S. S. (2001): Aquatic insects and mollusks of Pune city. Journal of Ecological Society. Vol.13/14, pp34-36. 4. Kharat S. S., Dahanukar, N., Raut, R. and Mahableshwarkar, M. (2002): Changes in fresh water fish fauna in northern Western Ghats, Pune region. Pros. Tropical ecosystem proceeding of international conference – Oxford BH, New Delhi- 2001 pp. 724-726. 5. Pande S, Saint, M., Ranade, S., Pednekar, S., Mestri, P. G., Kharat, S. S. and Deshmukh, V. (2007): An ornithological expedition to Lakashwadeep archipelago, assessment of threat to pelagic and other birds and recommendations. Indian Birds, 3: 2 – 12. ISSN 0973- 1407. 7. Pande Satish, Niranjan Sant, satish Ranade, Shivkumar Pednekar, Premsagar Mestri, Prashant Deshpande,. Sanjay Kharat, and Vaibhav Deshmukh, (2007): Avifaunal survey of Andaman and Nicobar Islands, January 2007. Indian Birds, vol.3 No 5, 162 – 165. ISSN 0973- 1407. 8. S. S. Kharat, Y. K. Khillare and Neelesh Dahanukar(2008): Allometric scaling in growth and reproduction of a freshwater loach Nemacheilus mooreh.Electronic Journal of Ichthyology. March, 2008 (1). 12. Sanjay S. Kharat and Snehal Kothavade (2012): Haematological study of Clarius batrachus with reference to Trypanosomiasis. Journal of Trends In Fisheries Research (1): 6- 9. Print ISSN: 2319-474X, Online: 2319-4758.
moreh (Sykes). Journal of Trends In Fisheries Research (1): 6- 9. Print ISSN: 2319-474X, Online: 2319-4758P. 26. Kharat Sanjay S. and Narke Vasant E., (2013): Evaluation of in vitro mutagenic and antimutagenic activity of Vitae Elixxir by Ames Salmonella Microsome Assay. International journal of Bioassays, Vol. 2, (11), 1480-1486. ISSN 2278-778X. 28. Ravindra V. Kshirsagar and Sanjay Kharat., (2014): Record of occurrence of Dugesia (Planaria) in fresh water pond, Pune, India. Journal of Bionano Frontier, Vol. 7(1): 1237-125. Print: ISSN 0974-0678, online: 2320-9593. Impact factor 0.045. 29. Nirbay s. Pimpale and Sanjay S. Kharat, (2014): Gonadosomatic index (GSI) and Fecundity of Rohitee ogilibii (Sykes) from Nira River Bhor, District, Pune (Maharashtra), India., World Journal of Pharmaceutical Research, Vol.3(10), 1277-1283. ISSN 2277-7105. 30. Nirbay s. Pimpale and Sanjay S. Kharat, (2014): Fecundity and gonadosomatic index (GSI) of Osteobrama vigoressi (Sykes) from Nira River Bhor, District, Pune (Maharashtra), India., World Journal of Pharmaceutical Research, Vol.3(6), 1223-1229. ISSN 2277-7105. 31. Sanjay S. Kharat, Nitin Sawant, Kishor Sonawane (2015) Karyotype analysis of some freshwater fishes of Mula and Mutha river Pune, Maharashtra. Dnyanamay, ISSN 2395-6898. 32. Nirbay s. Pimpale and Sanjay S. Kharat, (2015): Length- Weight relationship and relative condition factor of Rohitee ogilibii (Sykes, 1839) from Nira River Bhor, Maharashtra (India). World Journal of Pharmaceutical Research, Vol.4(9), 1199-1205. ISSN 2277-7105. 34. Kumkar Pradeep, Kharat, S. S., Sawant, N. S., Katwate, U., & Dahanukar, N. (2017). Freshwater fish fauna of Hiranyakeshi River, the northern Western Ghats, India. Journal of Threatened Taxa, 9(5), 10178-10186. Participation and presentation of research papers (oral/poster). 1. INNOVATION – 2013, Regional Conference for Pune University College Teachers. Dtd. 16 April 2013. Organized by Board of College and University Development, University of Pune. 2. INNOVATION – 2008-2009, Regional Conference for Pune University College Teachers. Dtd. 12th & 13th Nov 2008. Organized by Board of College Development University of Pune. 3. 2nd Global Conference on Entomology, Malaysia, Nov. 2013. Effect of Starvation on Digestive Enzymes of female Holotrichia serrata (Fab) (Coleoptera; Scarrabaetidae). 5. National Symposium on Recent Trends In Malerial Studies. Organized by Abasaheb Garware College, Karve Road, Pune 411004. 6. National Symposium on Status of Cold Water Fisheries with reference to Fragile, Himalayan Aquatic Ecosystems, Dtd. 29th to 31st Oct 2004. Organized by Post Graduate Department of Zoology, University of Jammu, Jammu. 8. National Conference on Zoology, Dtd. 21st to 23rd Dec 2003. Organized by Dept. of Zoology Vivekananda College, Agastheeswaram, Dept. of Zoology St. Jude’s College, Thoothoor. Under the Auspices of Zoological Society of India, Magadh University, Bihar. Invited lectures or presentations for conferences/ symposia. 1. National Level Workshop on Biodiversity Monitoring Orientation, Dtd. 21st to 23rd Oct 1999. Organised by, Indian Institute of Science Banglore, and Shri Bhuvnendra College, Karkala(Manglore) State – Karnataka. 2. National Conference on Recent Trends in Biotechnology In Contects of Animal Development and Environmental Biology, Dtd. 28th to 30th Jan 2008, organized by Arts, Science & Commerce College, Indapur, Dist- Pune in association with Associations of Zoologist, India. & National Environmentalist Association India. 3. UGC Sponsored National Conference on Biodiversity Monitoring and Research – Current Practice and Future Needs 7th & 8th Dec 2012, organized by Department of Zoology, Fergusson College, Pune. 4. UGC Sponsored State level Conference on Trends in Applied Zoology, Environment and Biotechnology, Dtd. 5th & 6th Jan 2009 organized by Balasaheb Desai College, Patan, Dist – Satara. 5. State level Seminar on Recent Trends in Biodiversity, Global Warming and Biotechnology. Dtd. 3rd and 4th February 2012.Organized by, Annasaheb Awate Arts, Commerce and Hutatma Babu Genu Science College , Manchar, Dist. Pune. 6. UGC Sponsored State level Conference on Conservation of Birds and their Environment, Dtd. 18th & 19th July 2009 orgainzed by Vinayakrao Patil Mahavidyalaya, Vaijapur, Dist – Aurangabad. 7. UGC Sponsored National Seminar on Modern Trends For Nature Conservation, Dtd. 4th & 5th October 2008 organized by Balbhim Arts, Science & Commerce College, Beed. 8. National Symposium on Emergence of Modern Techniques and Development in Biobusiness, Dtd. 18th to 20th Feb 2008 organized by Modern College of Arts, Science & Commerce, Ganeshkhind Pune 53. 9. National Symposium on Recent Trends in Life Sciences With Special Reference to Environmental Biotechnology & Biodiversity, Dtd. 10th to 12th Feb 2007. Organized by Kusumtai Rajarambapu Patil Kanya Mahavidyalaya, Islampur, Dist – Sagnali. 10. National Conference on “Recent Trends and Opportunities in Life Sciences” (RTOLS 2017) on 24th January 2017. Organized by Waghire College Saswad. Pune. 11. National Conference on “Faunal Diversity: Assessment and Conservation” on 22nd and 23rd January 2016. Organized by Post Graduate Department of Zoology, Modern College of Arts, Science and Commerce, Ganeshkhind Pune. 12. Training programme in YASHADA about “Freshwater fishes and Conservation” on 11 August 2016. Organized by YASHADA. 13. Training programme in YASHADA about “Personal Appreisal Latest Development on 8th August 2016. Organized by YASHADA. 14. National conference on “Environment and Development” on set 2016 organized by Dr B N Purandare Arts, Smt. S G Gupta Commerce and Science College, Lonawala. 15. Workshop on “Hands on Training to Develop Scientific Temper” on 5th December 2015, organized by S. M. Joshi College, Hadapsar, Pune. 16. Quality improvement Programme on “Role of Research to elevate teaching prospectus” on 5th and 6th Februry 2016 organized by College of Business and Computer Application, Chinchwad Pune. 17. International Conference on “Environmental Conservation by adapting New Technologies” on 28th & 29th January 2014 organized by Modern College shivajinagar, Pune. 18. National Conference on “recent Trends in Life Sciences” on 11th july 2015 organized by S. M. Joshi College, Hadapsar, Pune. 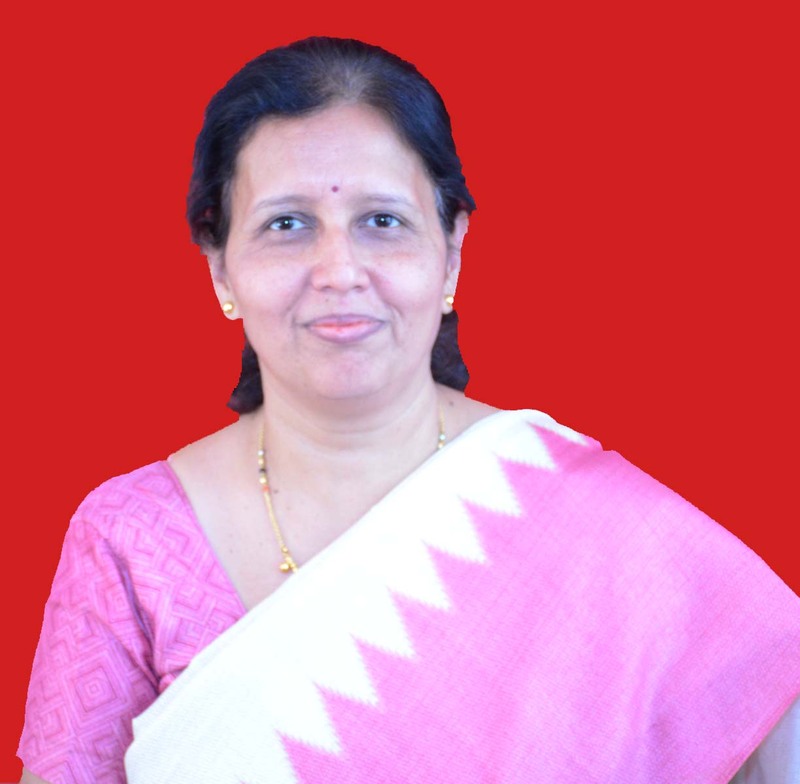 PU/DEV – 1019 29-08-2011 Dr. Korad Vishakha Shashikumar Dept. of Zoology, Fergusson College, Pune Species Diversity & distribution of Bats in India. PU/DEV – 1282 14-09-2009 Mr. Anand Padhye, Dept. of Zoology, Abasaheb Garware College, Pune Habitat Preferences Diversity, Mobility, Population Estimates & Conservation Implication of Scorpion Fauna of Saswad- Jejuri in Western India. SPPU/DEV/645 25/0502017 Dr. Nath Bimalendu Bikash, Dept. of Zoology, Savitribai Phule Pune University, Pune. Extracellular Hemoglobin of Chironomid Midge and Environmental Stress Tolerance. SPPU/DEV/645 16/11/2016 Dr. Morey Rashmi Aashay Evaluation insecticidal properties of plant essential oils against Musca domestica L.
SPPU/DEV/773 29/09/2016 Dr. Khandagale Abhay John, Dept. of Zoology Ramkhrishna More College, Akurdi, Pune. Insecticidal properties of three plant extracts against Culex quinquefasciatus Say and Aedes aegypti Linnaeus. Symposium on Pollution Control Technology, Department of Microbiology, M.E.S. Abasaheb Garware College, Karve Road, Pune, 41004. Department of Zoology, M.E.S. Abasaheb Garware College, Karve Road Pune, 41004. Workshop on Biological methods in soil improvement, H. V. Desai College, Pune. Workshop on Biodiversity monitoring, Department of Zoology, Modern College, Pune. National symposium on Eco-physiology and conservation of Aquatic living organisms- 8/1/ 1999 to 11/1/1999, Department of Zoology, Institute of science, Mumbai. Workshop on Quantitative approach of Biodiversity monitoring- 2/10/1999 and 3/10/1999, M.E.S. Abasaheb Garware College, Karve Road Pune, 41004 and Center for ecological Sciences, IISc. Bangalore at Tamhini, Dist. Pune. Biodiversity Monitoring Orientation workshop- 21/10/1999 to 13/10/1999, Karkala, Mangalore, Karnataka. Western Ghats Biodiversity Network (WGBN)- Workshop on statistical and Remote sensing techniques- 4/6/2001 to 10/6/2001, Department of Statistics, University of Pune, Pune. Discussions on People’s Biodiversity register- 29/11/2002 to 3/ 12/2002, organized by Center for Ecological Sciences, IISc. Banglore at Mendha lekha, Dist. Gadchiroli. (Vidarbha). National Conference on Zoology- 21/12/2003 to23/12/2003, at Vivekanand College, Kanyakumari, Tamilnadu and 14th All India Congress of Zoology, Zoological Society of India, Magadh university, Bihar. Workshop on Framing T.Y.B.Sc., Zoology syllabus-10/12/2004 to11/12/2004, at , M.E.S. Abasaheb Garware College,Karve Road Pune, 41004. Workshop on Framing T.Y.B.sc., Zoology syllabus- 27/12/2004 to28/12/2004 at Arts, Science and Commerce College, Indapur, Dist. Pune. National Trends in Modern Biology- 17/2/2005 to 19/2/ 2005, Institute of Bioinformatics and Biotechnology and Department of Zoology, University of Pune. Seminar on New Syllabus Of Biology For Std. XI – 27/4/2006 to 28/4/ 2006 organized by Biology Department of at, M.E.S. Abasaheb Garware College, Karve Road Pune, 41004. National Conference on Recent Trends in Biotechnology in Context of Animal Development & Environmental Biology, At Arts, Sci. Com. College, Indapur Sponsored by UGC and Pune University, Pune, 28th-30th Jan 2008. “Scientific Writing and Communication Skills”, M. E. S. Abasaheb Garware College & Vidnyan Bharati, Pune. 16th – 17th Feb 2008. Current trends in Biodiversity Conservation and Climate change. Modern Law College, Ganeshkhind, Pune. Technology and Higher Education in 21st Century. Saraswati Mandir night College of Commerce and Arts, Pune. Dr. Babasaheb Ambedkar yanchi vichardhara. Baburaoji Gholap College, Sangavi Pune. Qualification : M.A. Ph. D.
She believes in the motto that Success has no short cuts. Qualification: M com. B Ed. Working as vice principal from March 2005 till date. Worked as post graduate ( M Com ) coordinator from 2003 to 2005. Received Best teacher award from P.E. Society. Worked as the Vice Principal of science faculty for 10 years. Wrote a text-book for BCA course. Best teacher award by P.E.Society.